Travellers and Gypsies first arrived in England and Wales around the end of the 14th Century; since that time they have strived to protect their culture, history and identity, and in some cases, their own language. Many of them can trace their ancestry back to the 12th Century. Gypsies are usually of Scottish, English or Welsh descent; they will have Romany ancestry. Scottish ‘Travellers’, a nomadic ethnic group with strong musical traditions. 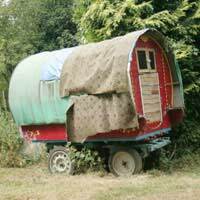 Irish Travellers, similar to Scottish Travellers with their nomadic lifestyle. People who, for generations, have travelled around the country with shows and circuses. ’New Travellers’, this is something of a misnomer as they are likely descended from travellers and may have gypsy blood. ’Roma People’, people that moved to the UK from Eastern and Central Europe, they usually have a strong Romany family history. Despite this rich and varied culture, they have been the subject of extreme derision and discrimination for most of their existence, with people in the communities they visit reacting to them with nothing short of suspicion and contempt. For centuries they were excluded from education and health care systems, although they were usually able to stop on common land for short periods of time. Despite various attempts to prevent the Gypsy groups from stopping on common land, it was in 1970 that Parliament passed a law bestowing a responsibility on local authorities to provide caravan sites for Gypsy families when they stay in their area. By giving the Authorities the responsibility the Government also publicly acknowledged the human rights of travellers to live their lives as they prefer to do; in a nomadic way. However, in a move that is reminiscent of the American treatment of Native American Indians, the Government also eroded some of the Gypsy right to stay on common land when, in 1994, the Criminal Justice and Public Order Act removed much of the duty to provide specific traveller and gypsy sites while simultaneously increasing police powers to move the families on if they park on unauthorised sites. UK Governments and Local Authorities may be eroding the gypsy right to park, but they are supporting the human right to education for all school age children, whether permanently or temporarily resident in the area. Most local authorities have a system in place to deal with the education requirements of gypsy and traveller children, this is not just a result of being nice – the law confers a duty to uphold their right to a proper education and the right to every opportunity; irrespective of their place of residence. Just as the Gypsy and Traveller community has a human right to education, they also have the human right to access adequate healthcare. This may be one of the most crucial human rights that we cherish and the fact that it may not be being administered is abhorrent but, in 1995, a report by the Minority Rights Group revealed that the travelling community suffers from an alarmingly poor life expectancy, poor nutrition and a great many treatable diseases. The reason that they may not be accessing their right to treatment could be one of many, from tradition to inadequate systems in place to enable the administration of healthcare. Whatever the cause there is a need for the traveller community to be able to access the other human rights that we cherish, such as equality, freedom from discrimination and respect. We may be an enlightened society but we need to do a lot more to look after those members of our society that choose to live a different lifestyle. Hi there thank you for your response but I have tried Crisis and Shelter and neither of them can help me. Because I can cook,I have a place to sleep with a roof over my head I am not classified as homeless. I am in the West Central Scotland. Neither of them could help me regarding find a safe place to park my camper-van and the sites that only a few councils offer is only for caravans and I cannot get a site. I;m really struggling to find a job as I don't have a permanent address and now I'm getting really worried about my van insurance as it will be coming up for renewal soon. Have you tried Citizens' Advice? Private camp sites etc? Hi there thank you for your response but I have tried Crisis and Shelter and neither of them can help me.Because I can cook,I have a place to sleep with a roof over my head I am not classified as homeless.I am in the West Central Scotland.Neither of them could help me regarding find a safe place to park my camper-van and the sites that only a few councils offer is only for caravans and I cannot get a site. I;m really struggling to find a job as I don't have a permanent address and now I'm getting really worried about my van insurance as it will be coming up for renewal soon. I have found myself having no choice but to live in a 'campervan' until I can find a permanent solution. But presently I am sleeping in supermarket car parks just so I can have a relatively safe place to sleep and everyday I have to move again to look for another safe place that night. I cannot afford campsite rents, £100-150 per week just for a pitch. Very few Councils offer sites to travellers and the few that do, only offer sites to caravans. So what do you suggest for a middle aged single woman who has no one to turn to for help and support? I am always moving and this makes it difficult for me to look at flats etc to rent or buy a cheap cheap one. I have no one to talk to, can't find support groups in the area, no job, I'm living on my savings and not being replenished due to not working. I can't apply for national contributions either.so it looks like I have no choice but to sleep in my van in the streets. I know I am better off than many but I'm really not coping well with this life style. YOu haven't said where you're based in the country, so we can't give specific ideas unfortunately. Have you tried Crisis or Shelter for advice or help? Citizens' Advice should also be able to give you some ideas for local support in your area, even if it is simply somewhere more permanent to park your van so you can look for work and accommodation etc. I have found myself having no choice but to live in a 'campervan' until I can find a permanent solution.But presently I am sleeping in supermarket car parks just so I can have a relatively safe place to sleep and everyday I have to move again to look for another safe place that night.I cannot afford campsite rents, £100-150 per week just for a pitch.Very few Councils offer sites to travellers and the few that do, only offer sites to caravans.So what do you suggest for a middle aged single woman who has no one to turn to for help and support?I am always moving and this makes it difficult for me to look at flats etc to rent or buy a cheap cheap one.I have no one to talk to, can't find support groups in the area, no job, I'm living on my savings and not being replenished due to not working.I can't apply for national contributions either....so it looks like I have no choice but to sleep in my van in the streets.I know I am better off than many but I'm really not coping well with this life style. Ask the housing officer about the allocations policy...it's likely that there is a points scheme - they will be able to tell you where you are on the waiting list and should also be able to give you information about other properties in the area to rent.